The latest Patch Tuesday updates fix a series of critical Windows 10 security vulnerabilities, making your system more secure. One of the most important cumulative updates for Windows 10 is KB3178469, which fixes a major lock screen vulnerability allowing attackers to execute code on a user’s locked computer. This vulnerability could allow elevation of privilege when Windows improperly allows web content to load from the Windows lock screen. Hackers with physical access to a user’s computer could use two methods to exploit this vulnerability: they can either connect to a maliciously configured WiFi hotspot or insert a mobile broadband adaptor. Once the breach has been exploited, attackers can simply execute malicious code on a user’s locked computer. However, the attacker would have no way to either force a user to connect to the hotspot or control the default browser selection on the user’s computer. 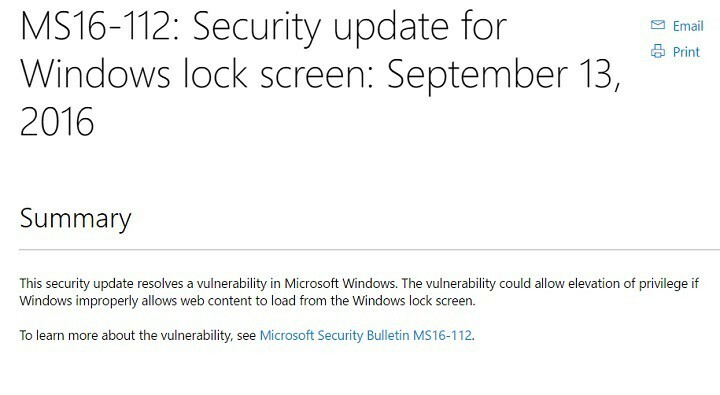 The security update addresses the vulnerability by correcting the behavior of the Windows lock screen to prevent unintended web content from loading. In other words, Windows 10 KB3178469 changes the behavior of the Windows lock screen to prevent hacker attacks. To install Windows 10 KB3178469 you can go to the Windows Update Center and search for updates or you can download the stand-alone package from the Microsoft Update Catalog website. There are no workarounds available to fix this lock screen vulnerability, and you should install this Windows 10 cumulative update as soon as possible. For more information about this cumulative update, you can check out Microsoft’s support page. Cumulative Update KB3178469 is also available for Windows 8.1 and all the editions of Windows Server 2012.